The Roswell incident is the most famous event in extraterrestrial lore. But, there's more to the story than government conspiracies and flying saucers. JOSHUA ROBERTS/AFP/Getty ImagesA group of protestors march in front of the General Accounting Office (GAO) to raise awarness about an examination being conducted by the GAO for documents about a weather balloon crash at Roswell, New Mexico in March 1947. In the summer of 1947, something crashed on the Foster Ranch in south-central New Mexico. The site was about 30 miles southeast of the small town of Corona, but it was 75 miles northwest of the larger town that gave this event its name: the Roswell incident. What that object was, what the government said it was, and what the public thought it could be has created a near-mythical confusion that has lasted over 70 years now. The Roswell crash happened to occur right at the beginning of what would be the American public’s UFO craze. So perhaps it was inevitable that the debris collected from the New Mexico scrub would come to be associated with alien life and contact from another world. This idea is so magnetic that even today around half the population of the United States believes aliens have visited Earth at least once, and Roswell is Ground Zero for the belief that they crashed here. Wherever there’s a majority belief, there will be people pandering to it. Candidate Hillary Clinton even made releasing the government’s files on the Roswell incident a campaign promise in 2016. This atmosphere of conspiracy and coverup doesn’t do anyone any favors. In fact, it arguably makes the story less, well… less cool. This is because what really happened at that ranch in New Mexico in 1947, separated from the fiction surrounding it, is a pretty interesting story on its own. 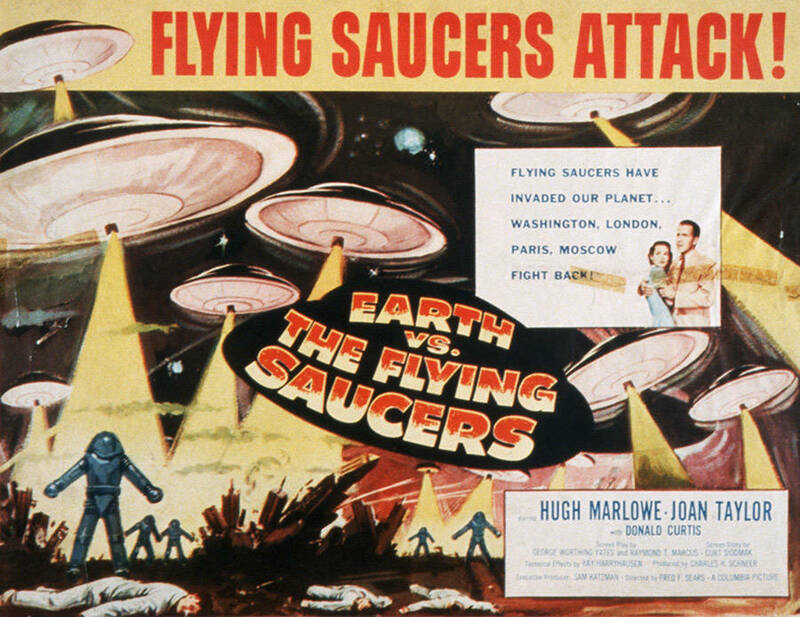 Library of Congress/Corbis/VCG/Getty ImagesPoster of Flying Saucers Attack! Earth vs. the Flying Saucers. To understand how the Roswell incident blew up the way that it did, it helps to have some context regarding other events going on at the time. In 1947, the United States had recently emerged victorious from World War II, a war that was to a great extent fought in the sky with (at the time) advanced technology. Early rockets had made news and jet aircraft were making test flights all over the American Southwest. Add to that the sudden appearance of the atomic bomb — a product of super-secret government research — and the mysterious air it gave the area around Alamogordo, which is just a few miles west of Corona. Of more immediate notice was the 1947 Kenneth Arnold UFO sighting. This was the first close encounter to make the news as contact with unknown flying objects. Arnold, a pilot, described the objects as white spheres that skipped “like flying saucers” through the air. Mishearing what Arnold said about his sighting, story-hungry reporters took the flying saucer angle and ran with it in their stories as a gag. 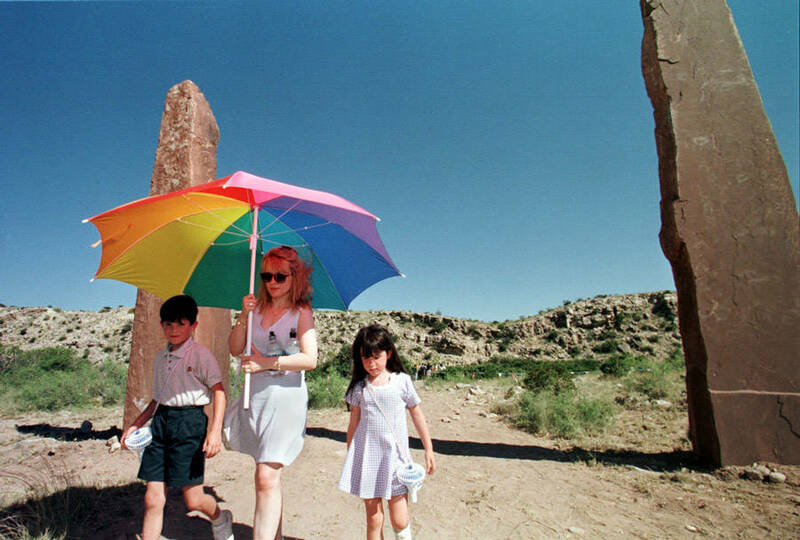 The Arnold sighting took place less than two weeks before the Roswell incident, which was close enough for “flying saucers” to be fresh in people’s minds, but long enough for local papers to need a new story. Then something went down at the Foster Ranch. 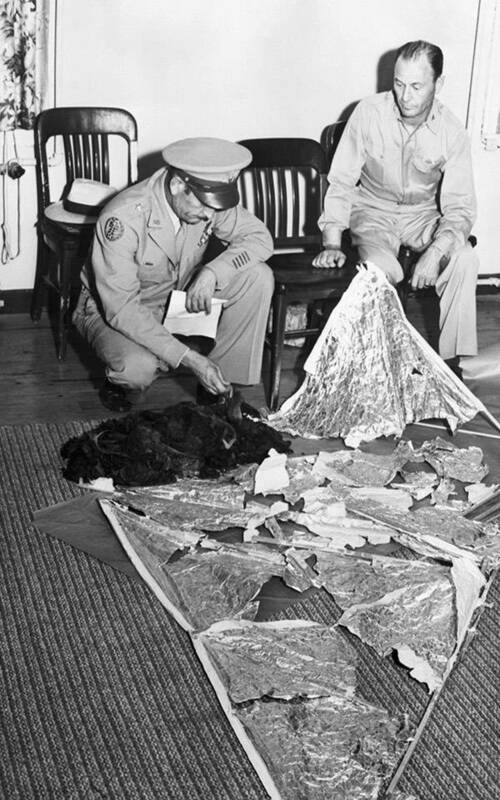 Universal History Archive/UIG/Getty ImagesJesse Marcel, head intelligence officer, who initially investigated the Roswell incident and recovered some of the debris from the crash site in 1947. On the morning of July 3, 1947, rancher Mac Brazel found some debris scattered over about 200 square yards near a service road on the ranch where he worked. Later reports became muddled, but his first description to the press was of finding strips of papery material that were covered with shiny foil. He also said he found broken strips of lightweight wood and plastic, some of which had odd symbols on it, and spongy bits of rubber. He described the foil as having small metal grommets embedded in it as if a cord used to pass through them. 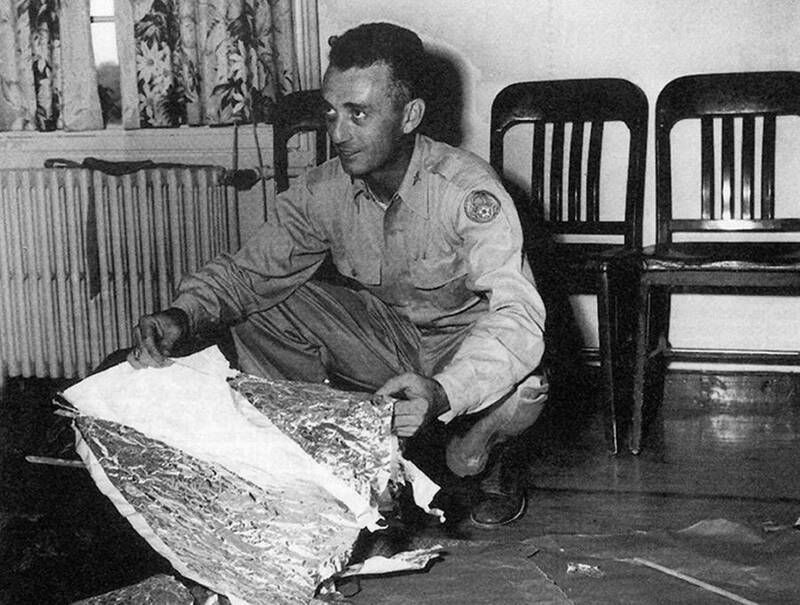 He specifically described finding sticks to the reporter for the Roswell Daily Record who came to take his story, and he described the debris as resembling a broken kite. Getty ImagesBrig. General Roger M. Ramey, Commanding General of 8th Air Force, and Col. Thomas J. Dubose, 8th Air Force Chief of Staff, identify metallic fragments found by a farmer near Roswell, New Mexico. This is the basis of the Roswell Incident, the supposed crash of an alien spacecraft. Brazel’s first impulse was to stick the debris under some brush and leave it there. But, a little while later, after hearing about the Arnold sighting, he told the local sheriff what he’d found and suggested it might be a flying saucer. The sheriff, a man named Wilcox, reached out to report the debris to the Air Force, which he knew was operating out of Holloman and White Sands, both of which were near the ranch where the material was found. Wikimedia CommonsRoswell Daily Record announcing the “capture” of a “flying saucer.” July 8, 1947. Fake news wasn’t entirely to blame for the misreporting of the Roswell crash. 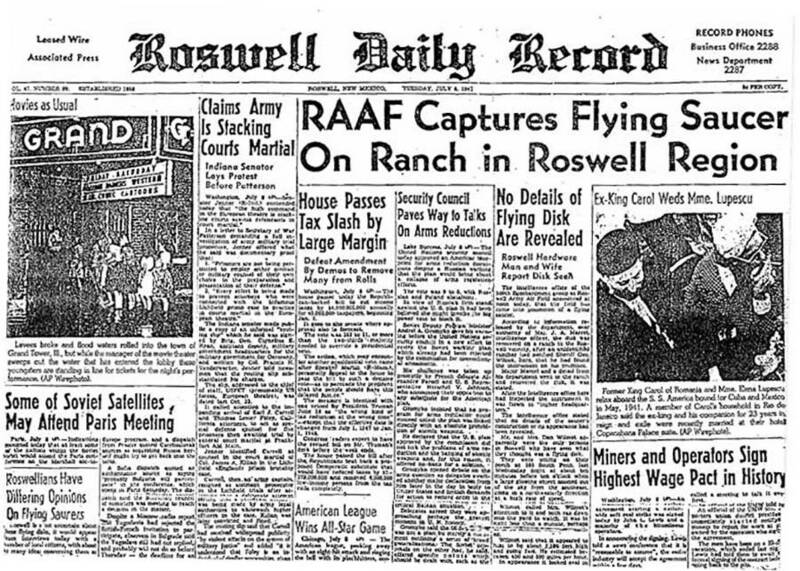 Almost all of the early reports of the Roswell incident were based on the July 8 press release the Roswell Army Air Field (RAAF) published, claiming a flying disc had been captured on a ranch in Roswell. Exactly why the Air Force felt the need to make this claim is not clear, though the local 509th Bomb Group’s Intelligence Office was certainly interested in covering up what the material had really been part of. It’s possible an overly creative press agent for the Air Force had simply grabbed a headline that had been floating around and spun it into a fun diversion from what really was a classified program nobody was supposed to know about. That program, as we now know, was Project Mogul, a then-Top Secret operation to test A-bomb detection hardware that was intended to be deployed near the Soviet Union. Mogul used commercially available weather balloons to heft a 5-pound “kite,” made of balsa wood, plastic, and mylar, up to an altitude of about 28,000 feet. There, the balloon would carry a microphone and drift at a stable altitude hoping to hear the rumble of an atomic bomb going off. The foil was part of a radar reflector that helped the base track the probe, while the “strange hieroglyphs” were minimalist floral patterns printed on the struts and some of the cellophane tape by the manufacturer — a party supply company. Eglin Air Force BaseA soldier sets off a weather balloon. This all had to be kept secret for several reasons. First, there was a general keep-it-from-the-Soviets attitude that permeated everything the military touched in those days. Second, the project itself was part of a larger technical spying effort to spot the first Soviet bomb test. If the Soviets found out what Mogul was, they could have made it harder to hear the bomb they wound up testing in 1949. Another reason for secrecy was the then-advanced technology project balloons used to maintain their altitude, which was quite a trick for a craft with no propellers or control surfaces. Instinctive dishonesty like this has a price. 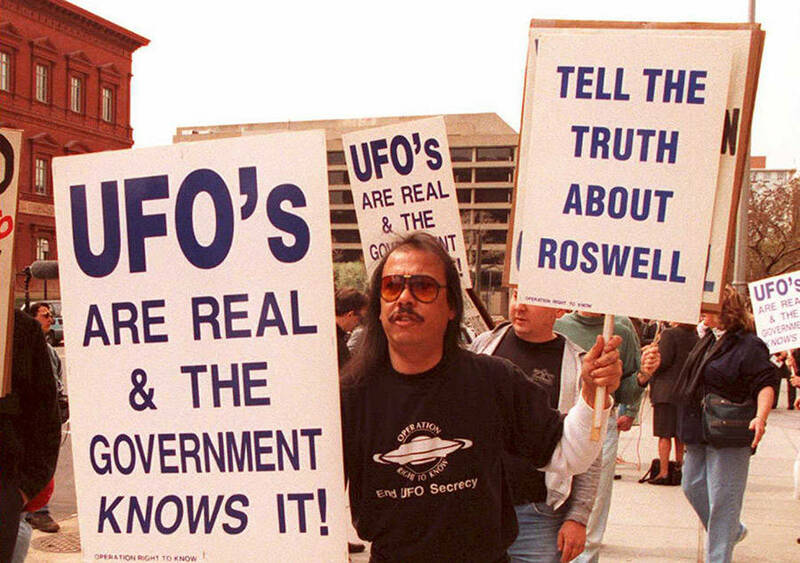 After an initial period when the weather balloon story was accepted by the public, interest in the Roswell incident picked up again after multiple documented instances were made public of the government outright lying about its activities. A full 30 years after the incident, those early reports of a flying disc, followed by hasty denials and an obvious coverup, proved too much to resist for authors Kevin D. Randle and Donald R. Schmitt. Their book titled UFO Crash at Roswell interviewed hundreds of people between 1978 and 1980 on the incident and helped spread the UFO craze out of Roswell. HECTOR MATA/AFP/Getty ImagesTourists leaves the alleged Roswell crash site, passing by a gate at Corn Ranch 30 miles north of Roswell. By the late 1970s and early 1980s, the American public had been through the wringer. From the Watergate scandal to the Church Committee’s revelations about the multiple times the CIA tried to overthrow governments and kill Fidel Castro, the country was ready to believe almost anything with regard to the government’s skullduggery. To add fuel to the fire, movies like Close Encounters of the Third Kind, which was all about the government trying to cover up alien visitations, were massive hits and often extended the public’s fascination with the other-worldly. In 1947, an actual alien spaceship crashed on the Foster ranch in Roswell, NM. The RAAF slipped up at first and admitted the truth, which was followed by a clumsy lie about a weather balloon a few days later. In the meantime, Men in Black arrived at the Roswell crash site to threaten everybody who knew anything about the incident and keep things hushed up. The bodies of the dead aliens were whisked away, along with the debris, to a hangar located at the infamous black site Area 51. 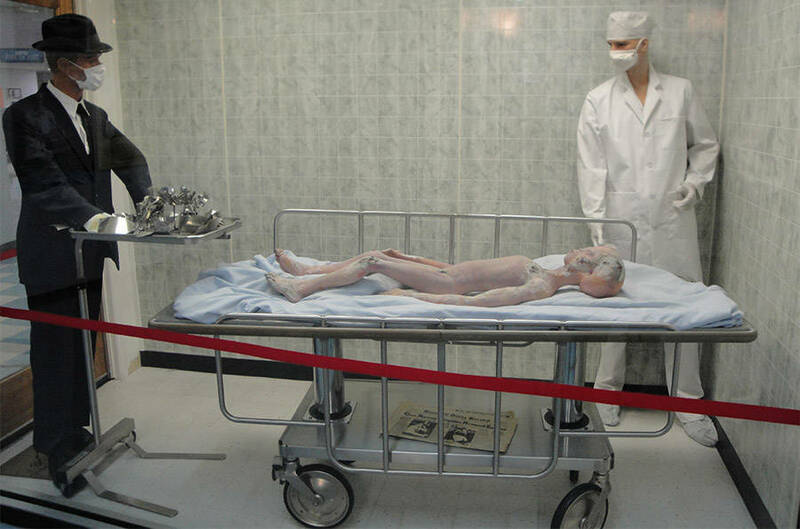 Wikimedia CommonsAlien mannequin displayed at Roswell Museum. That bit about alien bodies crept into the story during the 1978-80 interview process. Nobody seems to know exactly who was the first to have claimed they saw dead and dying aliens at the Roswell crash site, but by the time the Roswell story got wide traction in the 1980s, it was an indispensable part of the mystery. 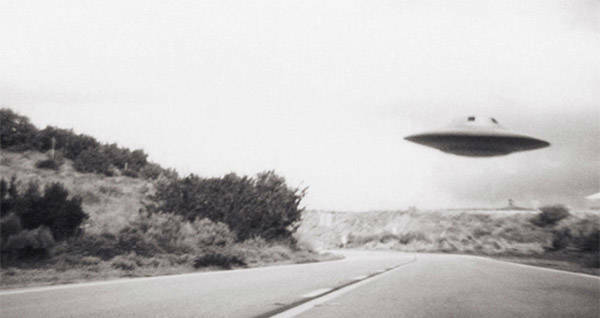 One person even claimed to have been with Mac Brazel on his first trip out to the Roswell crash site, where he said he saw a living alien walking around among its dead shipmates. Around the same time, in the mid-90s, documents purporting to be classified blueprints for the UFO were “leaked” to — no kidding — the National Enquirer. Sadly, none of the allegedly official descriptions of this advanced technology revealed anything a college-educated human being wouldn’t already have known about a power supply, propulsion, and life support systems. It goes without saying that the military vehemently denied all of this. When they finally declassified the details of Project Mogul it must have come as a surprise how few people believed it. Apparently, in the minds of over half of the American public, the Air Force developing a secret bomb-detection machine was less likely than an advanced alien race losing a ship and several crew members in the New Mexico scrub land, followed by a flawless 30-year coverup by the same government that couldn’t stop atomic bomb secrets from leaking to the Russians. The Roswell crash story is a lot of things. In reality, it’s a pretty neat glimpse at the sort of secret projects the tech wizards of the Air Force were into in the years between World War IIand the Korean War. In legend, it’s a spooky story about alien life and government cover ups. In delusion, it’s part of an ongoing project to keep the truth away from the American public. And perhaps, in a way, the fantastical stories about alien invaders, secret bases, shadowy conspiracies, and malevolent forces inside the government are a painless way for people to start talking about the very real corruption and culture of secrecy that does exist in the deep state. For many people, struggling to come to terms with the scandals and shocks of the 1970s and 1980s, a government-orchestrated alien coverup could have been a relatively painless way for them to broach the topic of secrecy and corruption at the highest levels, even if the subject matter was far fetched. Whatever the underlying psychology, the Roswell story opens a window into the very real way normal, almost boring, events can spiral into utter mythology in just a single human lifetime. If the “aliens” have anything to teach us at all, maybe that’s the most useful thing we could learn from all this. Enjoy this look at the Roswell incident? Learn about the bizarre beliefs of Raelism — the religion that says humanity is an alien experiment. Then read about 4 real U.S. government alien research projects straight out of The X-Files.